Is This Starbucks Sandwich An Example of False Advertising? Every day I get approached by food companies to review their products. Starbucks recently e-mailed me with their latest breakfast offering. They produced a NEW "chicken sausage, egg white and fire-roasted veggies in a wheat wrap" to grab along with your non-fat, double shot, venti latte. I decided to go and give it a try because I am looking for breakfast ideas that include vegetables. I get excited about a fast food company putting vegetables in its breakfast food because our diet is sorely lacking in veggies. If you get them at breakfast, it is a GREAT start on your 5-7 servings per day. Do you notice something? My sandwich in the top photo is lacking in veggies, while the Starbucks photo has quite a few surrounding that egg patty. I absolutely hate that I have to write a negative review of Starbucks, because I like Starbucks. I like that they give their employees healthcare and I really like their coffee. (Don't tell anyone but out of the local cafes in my town, Starbucks is my favorite.) This is going to sound crazy, but if I didn't have a job working on this website - I would work at Starbucks. I love coffee and those cute green aprons. There is like one cube of zucchini! Man, that is disappointing. Sad....WAAAAHHH! That is 31% of your daily value of sodium. When you look at the ingredient list below - which takes a PhD to read - you will notice that the vegetables are the last ingredients listed. The ingredients are listed in order of amount, meaning the more there is of an ingredient, the closer to the top of the list it will be. Does this mean there is more SALT than Zucchini? I kinda wonder. Actually, salt is listed four times, but not as a separate ingredient so the answer to that is no (most likely). Maybe, I got the one in the store that had the least amount of veggies and it was just bad luck. Or maybe veggies are more expensive than egg whites and wheat wraps so they skimp on them. My advice is to make your own egg white and veggie wrap and forget buying this one. Have you tried the new Starbucks breakfast wrap? 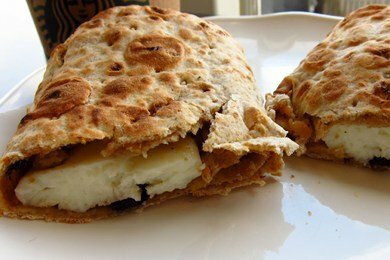 wheat wrap (water, whole wheat flour, enriched wheat flour [wheat flour, malted barley flour, niacin, reduced iron, thiamin mononitrate, riboflavin, folic acid], canola oil, vital wheat gluten, corn starch, oat fiber, soy protein, honey, salt, yeast, monoglycerides, guar gum, dextrose, soybean oil, sesame flour, yeast [inactive], calcium sulfate, calcium propionate, fumaric acid, l-cysteine, fungal amylase). egg white omelet (cage free egg whites*, whey powder, unmodified corn starch, nonfat dried milk, salt, butter flavor [sunflower oil, natural flavors, medium chain triglycerides, palm kernal oil], xanthan gum, guar gum, liquid pepper extract. italian style chicken crumbles (chicken meat, water, brown suger, less than 2% potato starch, spices [including fennel], salt, sodium phosphate, onion, paprika, garlic, bha & bht). red pepper spread (pasteurized milk and cream, water, sugar, dried roasted red bell pepper, whey protein concentrate, modified food starch, dried onion, dried garlic, cheese culture, salt, spice, stabilizers [carob bean and/or xanthan and/or guar gum], lactic acid, dried chive, natural falvors, enzymes). green zucchini. red bell pepper. mushrooms. yellow bell pepper. We have so many Starbucks around here that I think I will try one of their breakfast sandwiches. A friend from another state does work there and LOVES the benefits. BTW, Lisa, I love the Pin It button. I've pinned a couple of your things to my wall and I see others have already repinned them. I'm sad now! Why, why can't they make things more healthy? It's not hard, it doesn't cost more. I haven't found a fast food breakfast sandwich that I like yet! Less sodium please! The veggie count will def vary store to store DUHHHHHHHHH No rocket science here! If you don't like it you could always make your own and put 10 pounds of veggies on your sandwich if you like. I would only make this at home. All the ingredients have extra fillers and salt to boot. 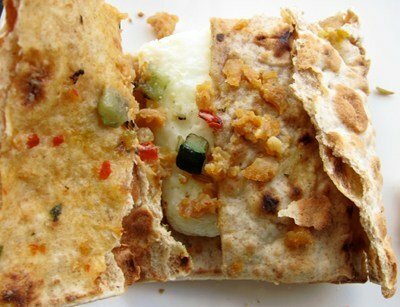 Egg whites, veggies in a low carb wrap toasted will taste much better. Add salsa to spice it up. @Lori - do you have a favorite low carb wrap? Thanks! 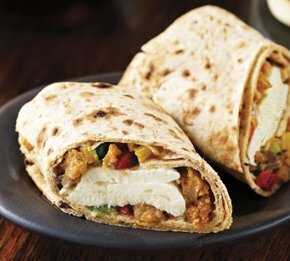 The wrap varies with veggies, but most are loaded with them. They tend to settle to one side of the wrap so you will just have to open it up and rearrange or as always if you aren't happy with a Starbucks product we'll do whatever we can to accomodate your needs/wants. BTW the spinach feta wrap is out of this world and under 300 calories, yum! Hmmm. I guess it's a better choice than a bagel from Dunkin'? *shrug* I don't think it is a fluke. I think it's false advertising. I'm a huge Starbucks fan, btw. What is that book about the Corporate guy that lost his job and worked at Starbucks (and it saved his life). That was a good book. I'm not Lori but my favorite low carb wrap is the Extreme Wellness High Fiber Low Carb Tortilla wraps by Ole Mexican Foods. They are a decent size, 71 calories, 2g fat, 17g carbs with 12g being fiber and 8g protein. For those watching sodium, it has 220mg sodium. There's a breakfast place I used to go to in Cambridge MA (Brookline Lunch) that puts root veggies in their standard potato hash. It takes some getting used to but after awhile it makes total sense, is delicious AND is a good opportunity to eat veggies with your omelette before noon. I absolutely LOVE that you included the WW points! I just tried this sandwich and wrote a bad review of it on Saturday. I did get vegetables in my sandwich but they all tasted like a one-note mushy, oily mess. These vegetables somehow had zero flavor. The egg was also very oily. I was disappointed because I love the turkey bacon egg white sandwich and instead I ruined my morning by trying this. I am not a big fan of Starbucks food to begin with but having this experience makes me realize that I need to just stick to the drinks and leave the food alone! I have to 2nd the spinach feta wrap. It is delicious!!! I am also a fan of the egg white and turkey bacon on whole wheat muffin. Hmm disappointing because I like new breakfast options as well. However, this is a great idea for me to make at home as an alternative to my veggie omelet. Any recommendations for the best chicken sausage available? I like Al Fresco but I wasn't sure if there is a better one around. So weird... I've tried a few of their new breakfast items and they all were packed with Veggies. It probably depends on the place you go to. I've only tried them from one particular Starbucks in town, (there are somewhere between 8-10 in our town) so it could just be them. So sorry you had such a bad experience with yours though! Seems like many "veggie" options really should read, "no meat". The title of veggie would seem to imply something from that food group present or at least present in an appreciable amount. Thanks for the review!